Living in Japan, timing things for the seasons has become more and more important to me. It probably starts for me with seasonal snacks, like strawberry-flavoured ice cream and kit kats in February and pumpkin-flavoured ones in September (and my favourite, caramel in the winter!) but also due to the flowers that come for so little time all year round, from the plum blossoms in January to rainy season's hydrangeas. I like to find books that are seasonal too, although sometimes the seasons are different in the west than in Japan, such as kite season, which is January in Japan but spring in Canada. I had no idea that this book would be so perfect for the season. I originally ordered it after seeing that Loon won the Ruth and Sylvia Shwartz Children's Book Award. 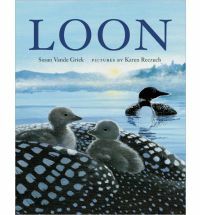 I thought it would be perfect for my kids who have fake loonies that they play with, to realize that there really are animals called loons which aren't around here. When it arrived this week I was pleasantly surprised that this book starts the life cycle of the the baby loons right at this time in June! Plus, this is perfect timing as a Canada Day (July 1) book as my kids are much more interested in Canadian animals than Confederation. But the best is that it arrived right after it was announced that it was nominated for the Norma Fleck Award for Canadian Children's Non-Fiction, and is the only picture book to be so honoured! The book itself is about the life cycle of loons in poem form. Two little grey loons are born in June and spend a few years on the ocean learning to swim, forage for food, and fly, before they molt and develop black & white feathers (and how disappointed were my children to realize loons weren't gold like the money!). As with most kids, my kids were interested in the predators, including big bass, turtles, and human boaters. There is a great deal of additonal information in the back, about the loons themselves and environmental threats to the birds. This would be a great companion book to the Big Green Book of the Big Blue Sea. Reczuch's illustrations are gorgeous. The season of the sea is easily shown through her gorgeous renderings. The chicks are adorable and any of these would make gorgeous paintings to hang on a wall. I reviewed this book for Nonfiction Monday, hosted this week by Capstone Connect. This is the 46th book I have read for the 5th Canadian Book Challenge. Hi there! That's terrific that you're so conscious of tying reading and traditions to the seasons. In California, I think I'm sometimes not as aware of seasonal changes as I would like to be. This book looks great -- just the other day I watched an adorable awkward fuzzy gray gosling exploring the edge of a creek. I laughed when he plopped down, then popped back up. I like the fact that this is told in poem form - it sounds enchanting. And, having vacationed in the Adirondacks frequently, I do confess to having a soft spot for loons. The cover is gorgeous so I can imagine the illustrations must be stunning! I found a YouTube clip of a loon song to show a Japanese friend and they just about fell over with surprise. Your kids might enjoy hearing (and copying!!) the call too! It really made the loon more unique for my friend who had just assumed it was a funny looking duck. It sounds just as enchanting as the birds themselves. They are a delight to see on a still lake from the viewpoint of a canoe! I love the idea of reading this for Canada Day.